Traps to target Wheatbelt ferals Landholders in the Wheatbelt are being encouraged to step up the campaign against feral animals by using cage traps on their properties. Natural resource management group Wheatbelt NRM is offering a six-month lease on traps in an effort to tackle the growing problem of foxes and feral cats. Helping coordinate the project is Wheatbelt NRM’s Biodiversity Project Manager Anika Dent. She said foxes and cats were directly responsible for the decline and extinction of many native animals in the region. “We know they prey on Mallee fowl, the Red-tailed phascogale and Black-flanked Rock wallabies,” Anika Dent said. “By giving landholders access to another tool to eradicate cats and foxes, they can help to improve their native bushland. 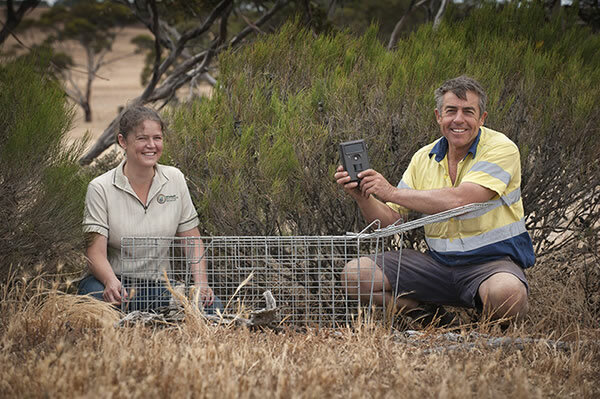 Cunderdin farmer Alan Carter has been using remote sensing cameras to film the behaviour of animals around cage traps. “I have had foxes walk around a cage, but to lure them in is more of a challenge,” Alan Carter said. “The trap needs to be in a position where foxes move, like a fence line, where it looks natural and non-threatening and the bait is appetising. Funded by the Australian government, the Wheatbelt NRM trapping strategy was being run in conjunction with the Red Card for Rabbits and Foxes program. This community based shooting and baiting program last year eradicated more than 4,500 foxes, 390 cats and 4,800 rabbits. Anyone interested in leasing a cage trap can contact Anika Dent from Wheatbelt NRM on 9670 3104.